No great move of God in history has ever occurred without having been preceded by the extraordinary prayer of his people. Log on to Facebook or Twitter, turn on the television, or pick up a newspaper and just try not to grieve for the shape of our culture. We need a great move of God. Walk our streets, visit our prisons, or spend some time in our poor urban centers and realize the overwhelming condition of our society. Then, instead of shaking your fist at hell, turn inward. What if we were to take a closer look at ourselves—the church? We possess the hope of the world, the world needs that hope, but we’re too busy dealing with our own issues to do anything about it. It’s time for change. It’s time for a spiritual overhaul. In Joel 1, the people of God found themselves in a similar predicament. They consecrated a fast, proclaimed a solemn assembly, and gathered the elders and all the inhabitants of the land. Together they cried out to the Lord for repentance, reconciliation, and revival. We’ve determined we must do no less. On Sunday, September 11, Church of God congregations will unite on their knees as they set aside regular weekend schedules for a singular focus—to cry out to the Lord. We don’t talk about solemn assemblies much in the church today, but maybe it’s time to bring them back. Sometimes we have to humble ourselves in solemn repentance, in sorrow for the sin in our culture and our movement. Maybe it’s complacency, apathy, and majoring on the minors that we need to confess. Could it be that we need to go to God in prayer acknowledging our lack of a disciplined prayer life—both personally and corporately? How long has it been since you cried out to the Lord in sincere desperation for his holy presence? This is what Cry Out to the Lord is all about. And as an initiative already making waves across multiple faith groups, Cry Out to the Lord is serving as a launch pad for a return to prayer as a necessary, not overlooked, component to ministry of the local church. 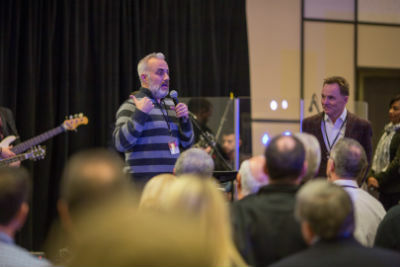 Photo: Stephen Kendrick (War Room) discusses prayer at Cry Out to the Lord – Atlanta. So we’re asking your church to imagine the possibilities. Consider the potential impact of one Sunday devoted solely to seeking the face of God. We’ll provide free resources to get you started, and it will be up to each church to decide exactly how to design their solemn assembly prayer experience. Some will choose to merge the prayer focus with their primary worship service. Others will plan a prayer gathering for Sunday afternoon or evening. Because September 11 holds significance in the United States, churches can avoid an awkward departure from the normal. Though not meant to be a memorial for the tragic events that occurred in 2001, Cry Out to the Lord is certainly an opportunity to pray for our nation. Through guided prayer, led by a pastor or lay leader, churches will intentionally blend worship with fervent prayers of humility, repentance, yielding, intercession, and recommitment to the Great Commission. Free resources, including step-by-step guidelines for hosting a Cry Out to the Lord gathering in your church, are available online at www.JesusIsTheSubject.org/cryout. Photo: Tony Evans, 2016 honorary chairman of the National Day of Prayer Task Force, at Cry Out to the Lord – Atlanta. 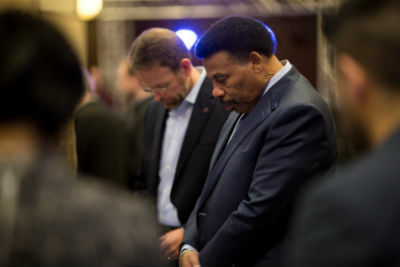 In January, representatives of the Church of God and numerous other faith groups met in Atlanta, Georgia, to participate in the first of countless Cry Out to the Lord prayer gatherings across the country. 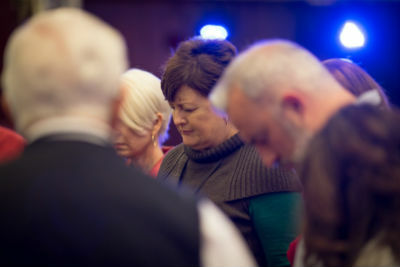 The Holy Spirit moved in a powerful way over two days that inspired, revived, and recommitted church leaders to the vitality of prayer in their own church networks and denominations. Attendees of this first Cry Out to the Lord testify to the indispensable nature of prayer, as well as opportunities to reemphasize prayer in the local church. Kansas Ministries regional pastor Charles Wright was one of those. “First, I pray the church recovers the emphasis the Bible gives to prayer,” he explains. “For example, Matthew 12:13 states, ‘My house shall be called a house of prayer…’ It seems much of the evangelical world has made our gatherings a house of singing and preaching/teaching, rather than prayer. Not that prayer isn’t offered, but in most cases time allotted to it is much less that singing and preaching. If we really desire to put first things first, we need to heed Paul’s admonition—‘First of all, then, I urge that supplications, prayers, intercessions, and thanksgivings be made for everyone, for kings and all who are in high positions, so that we may lead a quiet and peaceable life in all godliness and dignity. This is right and is acceptable in the sight of God our Savior, who desires everyone to be saved and to come to the knowledge of the truth’” (1 Timothy 2:1–4 NRSV; emphasis added). God is on the move in the Church of God, but we need a revival. Mercy drops ’round us are falling, but for the showers we plead! We cry out to the Lord. Resources and registration are available at www.JesusIsTheSubject.org/cryout. This entry was posted in All Church of God, Church of God Ministries and tagged Atlanta, awakening, Cry Out to the Lord, domestic ministries, fasting, Georgia, Joel 1:14, pray, prayer, repentance, revival, sacred assembly, solemn assembly, special events. Bookmark the permalink.